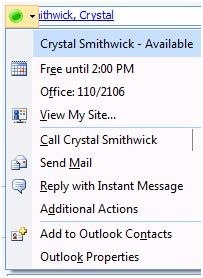 The new feature in Microsoft Dynamics CRM 4 and CRM Online that I use every day is instant messaging. 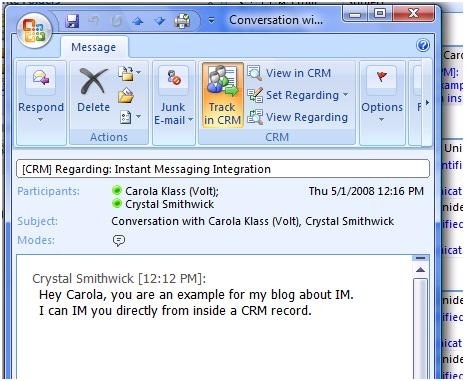 Yep, I can IM from inside CRM! 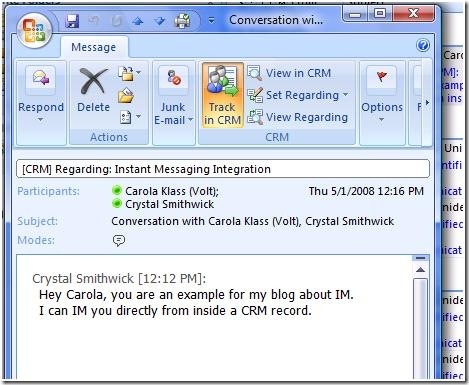 If your company has Microsoft Office Communicator enabled and you are using Microsoft Dynamics CRM for Outlook, you can install Communicator on your computer and chat anywhere you can see the IM presence in Microsoft Dynamics CRM. 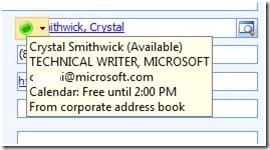 (Assuming of course, that the other person has an IM too and has an e-mail address.) The IM presence (or gumball as most like to call it) appears in most lists that include customer or user name with an e-mail address. There are a couple of Help topics you can read about how to make it show up if it doesn’t already. Here’s how it works. The green ball is the gumball, jewel or presence. I like gumball. You can hover over the gumball to see a summary of availability. Or click the tiny down arrow beside the gumball to see the communication options. To start a conversation, click Reply with Instant Message and start typing! When you are done and before you close the conversation, you can save it as an e-mail. In Outlook, the conversation is saved in your Conversation Folder. 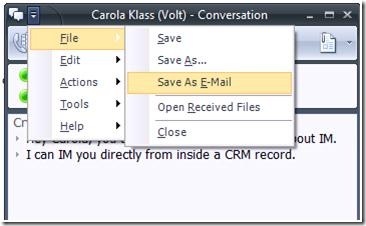 You can open it and then click Track in CRM (or Set Regarding to save a step), and select a Record in CRM. 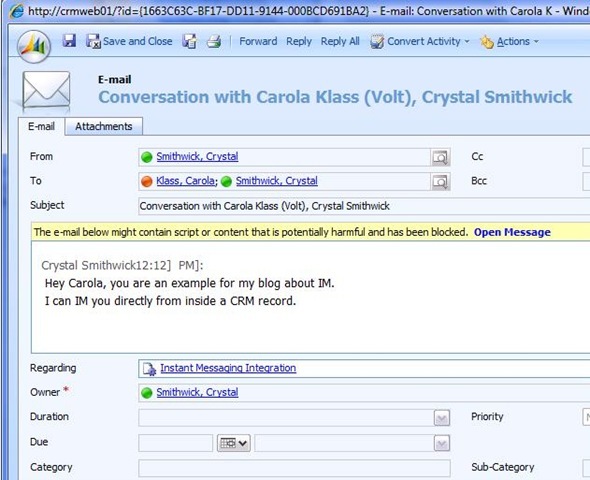 Just like regular e-mail messages the conversation will be saved as a linked CRM record. 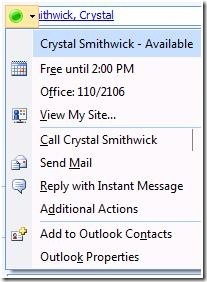 And here is the saved e-mail record in CRM. The Subject line captures that it is a conversation. This conversation is really just an e-mail activity and can be managed in the same way as other activities. So, if you ever see my gumball green, send me an IM.